Critics Assail Creation Museum Ken Ham's $27 million Creation Museum project was built entirely with private money. Yet it was bound to attract skeptics and detractors. And protesters will be out in force Monday. What might people find objectionable about the exhibits? 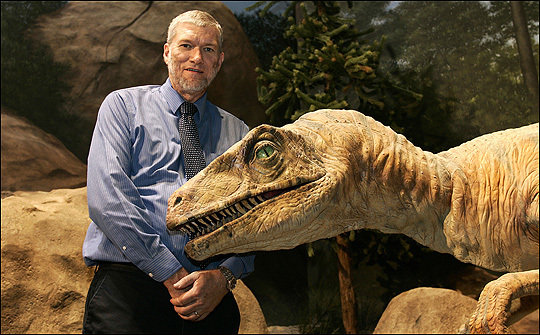 Ken Ham's $27 million Creation Museum project was built entirely with private money. Yet it was bound to attract skeptics and detractors. And protesters will be out in force Monday. What might people find objectionable about the exhibits? NPR's Barbara Bradley Hagerty went there for the opening and joins us on the line. Barbara, welcome. BARBARA BRADLEY HAGERTY: Well, thank you. INSKEEP: I understand some people are protesting this opening? INSKEEP: Oh, by all means, put him on. Dr. LAWRENCE KRAUSS (Physics, Case Western University): Hello, there. INSKEEP: Hi, Mr. Krauss. It's Steve Inskeep. Dr. KRAUSS: How are you doing? INSKEEP: I'm doing okay. What brought you to the museum today? Dr. KRAUSS: Well, as a scientist who's interested in really trying to get better science education in the country, it's important to speak out against something that pretends to be an educational institution but in fact is exactly the opposite. INSKEEP: What do you mean pretends? Dr. KRAUSS: Really, it's anti-science rather than pro-science. They pretend - in fact, the way science works is that we actually ask the questions of nature, we let nature give the answers. And in this case, this is an institution that claims to know the answers in advance and then pick and choose what they want to hear. And of course that's not the way science is done. And the young people are going to come here and be confused about science. And we really need to do a better job teaching science, not a worse job. But I think it's important to speak out against nonsense. INSKEEP: Now, before we got on the phone, we did hear a recorded interview with Ken Ham, the head of the museum, who said, hey, there are certain items in the fossil record that you can read more than one way, and there are different interpretations of the fossil records, some of which might support my point of view. Does he have a point there in that there are some inconsistencies in the record? Dr. KRAUSS: No, of course they don't have a point. The point is that it isn't just fossil records or evolution; it's everything. Every aspect of science, from physics, chemistry, biology, astronomy, geology, everything we know about the universe tells us it's not 6000 years ago. And you can't - if you really believe the Earth is 6000 years old, you shouldn't be driving a car or even listening to the radio, because the same laws of physics that govern those things tell us that the Earth is billions of years old, not thousands of years old. It's a huge error. It's not a little mistake. It's like trying to measure the length of the United States, and instead of coming up with several thousand miles, coming up with five yards. It's just totally absurd. INSKEEP: You're going to visit the museum today? Dr. KRAUSS: I'm going to try. I'm giving a lecture here at the rally and then I'm going to try to take a look at the museum, yes. Actually, I've taken a virtual tour already. INSKEEP: Okay. Well, thanks very much for talking with us. Can you hand the phone back to Barbara Bradley Hagerty please? Dr. KRAUSS: I'll hand it back to Barbara, sure. INSKEEP: Hi, Barbara. Just one last question and we're done. Can you give us an idea where this Creation Museum fits into the larger political debate in different parts of the country over creationism, intelligent design, evolution, whatever people want to stand for? HAGERTY: It's smack in the middle of creationism, but I have to say that creationists are a small subset of the group calling into question evolution. You mentioned intelligent design. Intelligent design does not rely on the Bible. It just says that the world is complex and wonder (unintelligible) there had be a designer. But what creationists do is they actually name the designer. They say it's the God of the Bible, of Genesis, the God of Christianity. INSKEEP: Barbara, thanks very much. INSKEEP: NPR's Barbara Bradley Hagerty is outside the Creation Museum, which is opening today in Northern Kentucky. 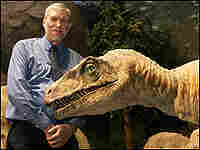 Ken Ham poses with a mechanical Utahraptor at The Creation Museum. Twenty-five years ago, Ken Ham says, he felt a calling to build a museum to promote creationism. A quarter-century and $27 million later, The Creation Museum has opened in Petersburg, Ky., just outside Cincinnati. The displays offer the creationists' view of how the world came to be, which differs sharply from the teachings of science. "There is a conflict if you try to add evolution to the Bible and take Genesis as literal history," he says. "For instance, the Bible teaches man was made from dust in [the book of] Genesis … whereas evolution would teach that man came from some ape-like ancestor. "I know there are many Christians who say they believe in evolution [over] millions of years," he says. "I would say they're being inconsistent in their approach to scripture. A literal Genesis is actually the foundational history for the rest of the Bible for all doctrine. Ham's view explains why visitors enter to see two animatronic baby dinosaurs alongside two children. "When you have dinosaurs and people together, that makes a statement concerning one's belief about the age of the Earth and evolution," he says. "Obviously it flies in the face of what secular evolutionists will teach." Ham says the museum – which drew protesters on Monday – does try to cover both sides of the debate. "We actually do give both sides as people walk in," he says, explaining that a fossil exhibit has "a creation paleontologist" and "an evolutionary paleontologist" offering different interpretations of the same fossil. He rejects the idea that science has a lock on empirical evidence. "All scientists have presuppositions that they start with that determine how they interpret evidence," he says, adding that scientists were not around to see dinosaurs walk the Earth anymore than creationists can claim to have been present to observe Adam and Eve. He remains hopeful that the museum will attract skeptics as well as believers. "I think a lot of people will come who don't agree with us," he says. "There are people who won't go to church, but who will go to something like this."